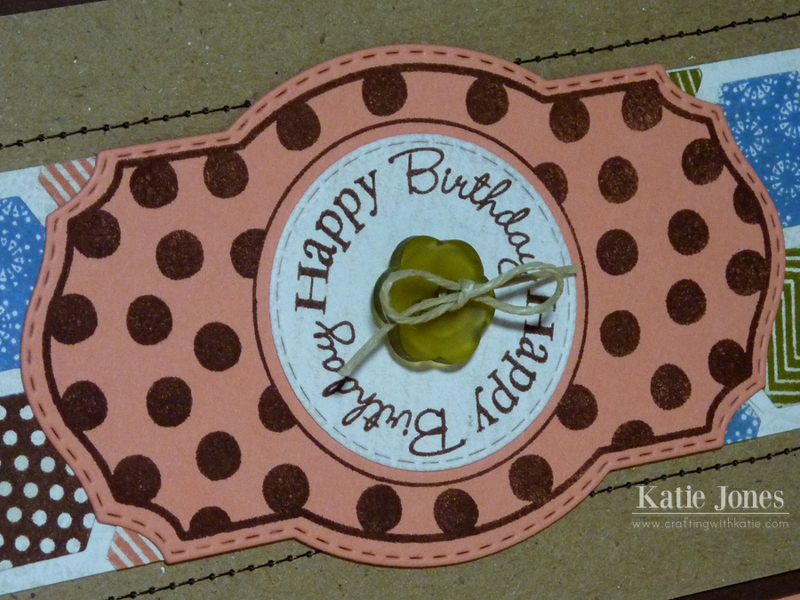 crafting with katie: Birthday Fun! I made this sweet birthday card for a friend using lots of dies. It's sized for a small business size envelope at 7" x 6 1/4". 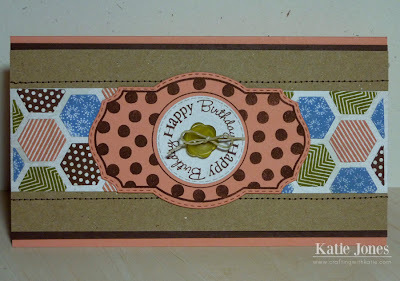 I started by making the strip of hexagons using the Papertrey Ink Hexagon Die Cover Plate, stamping the hexagons with the Happy Hexagons stamp set in colors that my friend loves. After adhering the hexagon strip to the kraft paper, I pulled out my sewing machine and stitched a couple of line along side of the strip. 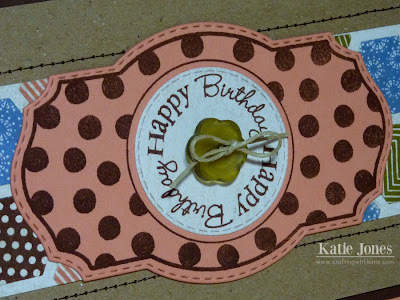 The fun polka dot tag was cut with the My Creative Time Vintage Stitched Label Die and stamped with the polka dot frame from Vintage Label Stamps. I then added a die cut circle made with the MCT Stitched Circle Die and stamped with a sentiment from MCT's All Around Birthday. That cute little button is from the Papertrey Ink Ripe Avocado Button Collection and tied with Thick Kraft Hemp Twine from Liz's Paper Loft Boutique. Very nice card and so colorful! Your card is so cute! I love your paper choice! What a pretty card Katie! 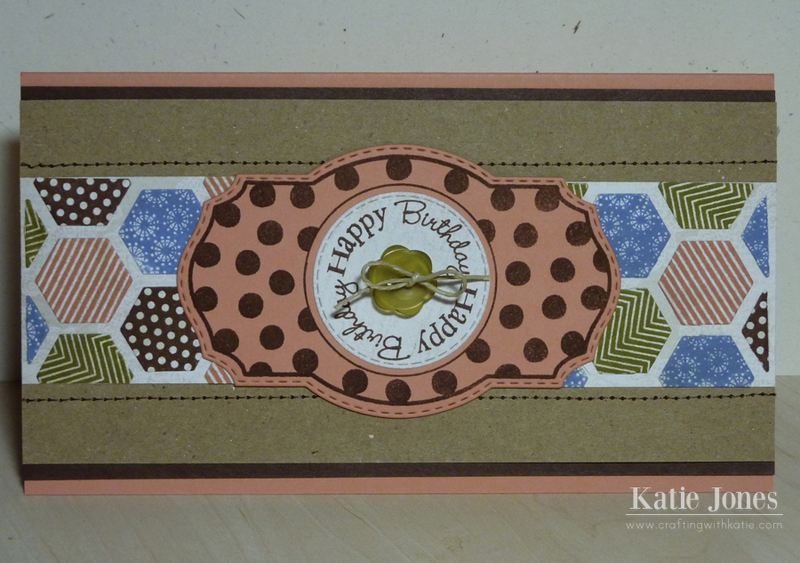 I love making cards in unexpected sizes. Your friend is going to love it. 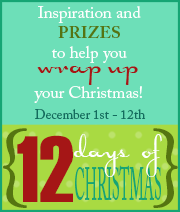 Katie ~ So happy you got my card done for next June! LOL!! Seriously now ~ you know I LOVE all these dies but look at the design of your card ~ I LOVE it!! What a PERFECT touch with the sewing too!! LOVING this color combination ~ so PRETTY!!! katie, your stamp is pure perfection! it's perfectly straight! and your card is darling too! Love the colors of your card, love the shape too. Great job.